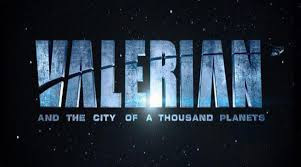 Valerian and the City of a Thousand Planets is a masterpiece. A masterpiece of filmmaking and of visual storytelling. It is a huge sprawling space epic that contains a beautifully created universe where anything is possible. It is alive and vibrant and does not follow American movie conventions. It is unlike anything I have ever seen except for the Euro-comics that it is based on or that it’s source inspired. It is overwhelming, exhausting, and maddening. It’s a film that foregoes straight forward exposition and dares us to keep up. It is clearly the work of only one filmmaker Luc Besson, whose Fifth Element is the only work of live action cinema I can compare it to. Major Valerian and his partner Sargent Laureline speed toward their next assignment , Valerian has a weird dream that haunts him. Tasked with retrieving a converter, a creature with the ability to make copies of anything it eats the pair accomplishes their assignment and then heads back to their home base- just in time to get involved with a strange radioactive void in the center of the city. What happens from there, and how it relates to Valerian’s dream, is the film. What I love about the film is that Besson has made a film where the world all hangs together. While so much of the film flies by at speed everything feels connected. While the film might collapse if we stayed in the various section longer than we do, what we see is hangs with everything else to make a real world. It is a film that may very well be one of the great comic adaptions because all you really can compare it to is that of the great European comic masters who turned out dense stories with dense visuals. The film reminded me of my old issues of Heavy Metal or the works of the artists the magazine brought to the US. The plot moves along at speed daring us to keep up. Any exposition, other than a clunk portion about an hour in, only occurs where we need to have it. The result is a film that is actually about the world of the film instead of explaining it. The casting of Dane DeHaan and Cara Delevingne in the leads is against Hollywood thinking but brilliant. Since the character do not behave in prescribed ways why have faces we know? Their interaction with each other and the world is alien as it should be considering the film is set 400 years or more in the future. The casting of unknowns gives us a blank slate and no expectations. Rihanna is quite good in the film. I really like the character and her performance. My single problem is how she leaves the film comes off as kind of lazy. It wasn’t necessary. It smells of Besson not knowing what to do with her past the logical point. To be honest I don’t know what I think of the film over all. I desperately need to see the film again. As an experience the film is awesome in the truest sense of that word. But as a film, as a story I need another pass through to get y words together since my one reaction to the film is feeling as if I was bludgeoned by it.